Villa Camaleao lovely private villa 7 bedrooms, 5 bathrooms, 2 pools set in its own walled grounds, landscaped gardens with views looking over the quiet countryside. secure parking,electric gates,cobbled drive lined with almond and pine trees. Lovely villa for relaxing and alfresco dining,garden cocktail bar,BBQ The villa is located near Porches, which is renowned for its Pottery/Local wine, and only 2km from the fishing village of Armacao de Pera with its lovely sandy beaches, a range of restaurant cafes bars, supermarket Golf and horse riding within easy reach. Furnished to high standards in Italian leather sofa TV/Video, DVD and video library, music I pod system. WiFi Archway leading into fully equipped kitchen. Salgados 18 hole. Alto 18 hole. Pinta 18 hole. Gramacho 18 hole. The above golf courses are within 15 km of the villa, we are surrounded with golf. Notes on accommodation: Villa Camaleao is a comfortable family villa 7 bed rooms 5 bathrooms. Private and not over looked, suitable for all ages. 2 Pools one is heated with waterfall. All the bedrooms have remote control ceiling fans or air-con. Large dining area with BBQ, pool side pergola and cocktail bar. Out side shower/wc The villa has electric entry gates and security doors and private parking. located near to the local town of Armacao De Pera. Extra's available ie Z-Bed, cot/high chair. extra person, Z-beds available £100. cot/high chair £50. per week. Outside: Private gardens peaceful and relaxing private pool 8x8 metres,Second pool 70cm deep is heated with water fall also outdoor shower/wc. Complete with sun loungers and patio furniture. Barbecue, comfortable dining area. Pergola and cocktail bar Games full size pool table and table tennis. Utility Room: Washing machine, dishwasher. Iron/ironing board. Cleaning / Towels / Linen / Maid service: Maid service 2 times weekly, clean towels twice a week and clean linen once a week, this is included in the rental. included in the villa rental is use of towels at the poolside or beach . Other: Patio doors leading out onto walk around balconies overlooking the pool and gardens. Large dining area, relaxing pergola area and cocktail bar. Views overlooking the peaceful country side. Games Pool table and table tennis. What a fabulous holiday! The villa was beautiful. The outside space was ideal for our large family both during the day and the evenings, we ended up venturing out only occasionally. The rest of the time enjoying the well thought out outdoor space - lounging by the pools and in the evening enjoying the bbq and eating areas, with the table tennis and pool tables on hand to amuse some of the children. Jane and Steve were wonderful hosts - available to help if needed, completely left alone if not. Thank you for a very fun and memorable week! 12 of us stayed in this property for a week, including 3 generations and 5 kids. We had an awesome time. The property is brilliant, with a lovely pool, a smaller one for relaxing in, and a bar, terrace dining and BBQ. It was a short ride to the beach, and a walk to Aqualand. The holiday was perfect, and Steve and Janie were perfect hosts. Thank you for your 5 star review it was lovely to meet your family and lovely friends. Glad you enjoyed your holiday and it would be nice to see you in the near future. 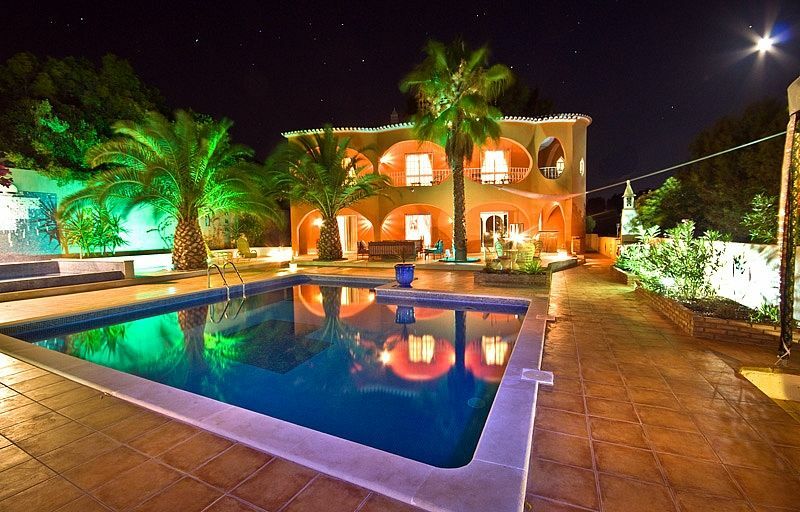 Love Portugal and love this villa. Over the years have watched this villa evolve . Every time I have returned some thing new has been added or upgraded. A car is advisable because there are so many places to visit around the area. The owners are really helpful and know the area very well. We initially chose this property because of the amazing reviews and they were all spot on. The property is in a lovely condition and the outside is especially good. Which is important as most of the time is spent outside. Steve and Janie were terrific hosts. They responded to any questions immediately but did not impose at all. The taxi recommended was excellent and always reliable. We appreciated the twice weekly clean so were always comfortable. We would definitely recommend this property. Thank you for your kind words, for me and Janie it is always great to here what you think of your holiday . We attended the Villa for a 50th wedding Anniversary and the villa was totally suitable for our large family . The Villa had everything we needed and was fabulous to entertain with many areas for every one to enjoy with the swimming pools entertaining all. Steve and his lovely wife (owners ) assisted in arranging a cake to be made locally which was excellent and offered to pick us up from supermarket on first day when we landed . We would recommend a car if you have hot days like we did although only a 20 min walk into the town by beach however we used the recommended airport transfer company Prestige Cars who where excellent and we used them all week it was great as the family run company could not be more helpful and assist us with our every need HIGHLY RECOMMEND THEM . Perfect villa for family holiday, 13 people in total. Lots of space in the garden around the pool to relax. A warm welcome from Janie and Steve who were on hand to help out with anything we needed. They even organised a birthday cake for us! Excellent taxi service was also on hand at all times to take us into the town and to and from the airport. Bedrooms were lovely and immaculate with great space. Every single family member was delighted with this gem of a place. Top of the morning to you, it sounds better as I write it. Thank you for your stay with us and your kind words, you have such a lovely family it was a pleasure having you. Horse riding, Bird watching, country walks, the owner has a fishing boat and he tells everybody about the big fish that got away, ha ha ho ho. Armacao De Pera is 5 minutes by car or a country walk takes about 30 minutes, attractive palm tree lined the promenade overlooking the beach, good for swimming and water sports. Other local beaches near by Senhora De Rocha a small sandy beach between Porches and Armacao De Pera a good place for a boat trip with the local fisherman. Benagil is a nice small beach. Praia Da Marinha lovely beach with impressive cliff top walks. All of these beaches are a short drive from the villa. Faro is the nearest Airport 40mins drive, a Car is not essential, the taxi service is very good but if you like to venture out to places of interest it would be nice to hire a car. 2 Traditional portuguese restaurants and bar are in 5 minutes walk from the villa. Other interest Aqua Land the water park is in walking distance. The Zoo Marine is a short 10 min drive, a chance to see and experience some of natures beautiful sea creatures, an entertaining and educational day for all. Algarve Shopping Centre 15mins. Booking Notes: 25% Deposit on booking, the balance to be paid 8 weeks before arrival. A £500 breakage bond is required with the final payment. This will be returned within 48hrs of departure providing no damage has occurred. Changeover Day: Saturday changeover as we have found the flights cheaper for large groups. and more flights available. We are flexible for change over in April and September. No booking taking on all Male or all Female parties. smoking is not permitted inside the villa.